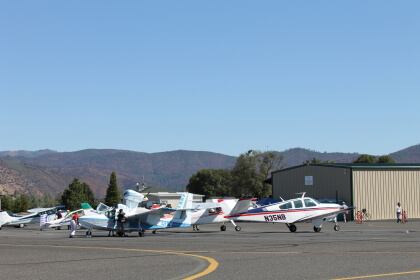 Pine Mountain Lake Airport is owned and operated by Tuolumne County. Facilities on-site include: fueling, maintenance and parking. North Latitude 37, 51' 45"
West Longitude 120, 10' 40"
Runway: 27/09, 3,625' long with 100' (lighted) overruns at each end. Surface is asphalt cement pavement. Right traffic runway 27. Tie Down Area: Paved, approximately 54 tie downs. 5 transient tie downs available on west side of ramp south of fuel pumps. Overnight fees: $5.00 single, $10.00 twin. Special Note: This is a Noise Sensitive area. PML pilots invite the community to a fun and exciting afternoon at the airport, including aircraft displays, formation flying, skydivers, precision flying contests, airplane vs. car/motorcycle races, model aircraft and other aerial feats. Free admission. Refreshments available for purchase. Park on Elderberry off Ferretti Road and enter under the banner. Bring a lawn chair and a hat, and enjoy the day. For Community Airport Day information, check the PML News or contact: Bonnie Ritchey (650) 996-6274. For Young Eagles information contact: Ed Sunday, EAA 1337, Young Eagles Coordinator (209) 533-1405 or Ed Gregory, EAA President (209) 962-5061.